It's time for the SEMA Show again! It's time for the SEMA Show, once again in Las Vegas. Our team is once again at SEMA. Stay tune to our posts for updates, behind-the-scenes reports and pictures of fast cars and hot booth babes. Here's just a little sampler of one of the cars that are slated to be on display. The folks at Classic Reflections Coachworks will be displaying a wild conversion Corvette. This is a tribute to the 1962 Corvette, done using the chassis from a 1993 Corvette. CRC's website has a great detailed chronology of the car's creation. The great part is this vehicle is not just a one-off. You can order yours! 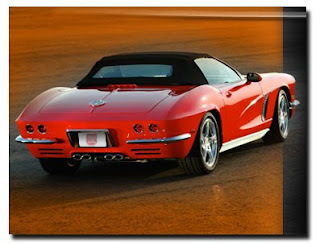 All you need to provide is a "donor Vette", to which they will affix the new body. We'll be updating our posts as fast as we can, so stay tuned! !